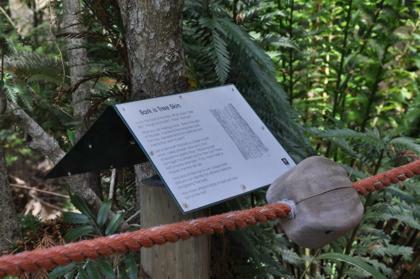 The Braille Trail will take you 15-30 minutes to complete and is 0.45 km long. It is a short, self-guided trail that gives unsighted people the chance to discover an indigenous forest, unassisted, and encourages everyone to explore the forest with all their senses. The trail starts and ends at the Fragrance Garden. The entire trail is outlined by a guide rope. It takes you on a circular, winding route through natural forest and over wetland, which is home to many birds and frogs. The path is mulched with no steps. Boardwalks take the visitor over the wetland area and over any exposed tree roots on the path. Wheelchair users can take the trail but will need assistance as the path is relatively steep and the surface is rough and uneven. Blocks on the guide rope mark the stopping points where there are signs that describe the forest and the plants and animals living here, or explain how to find the benches and water fountain. All signs are in large print as well as Braille. Cunonia capensis (red alder, butterspoon tree or rooiels) with its glossy foliage, showy white flower spikes in autumn, and unusual spoon-shaped buds is prominent on the trail. Near the first bench is a magnificent Ilex mitis (African holly) and near the end a huge old Quercus robur (English oak) that dates back to the time when Kirstenbosch was a farm. Ferns on the trail include Todea barbara (King fern) andBlechnum capense (Cape deer fern).